Will you be spending the New Years in Japan next year? Haven't decided on what to do or don't know where to go for the New Years in Japan? Then this tour will be perfect for you! Why not start the new year on a bang with a traditional Japanese New Years event on a cruise ship! Taiko is an ancient Japanese large drums. One of taiko's defining aspect is it's dynamic playing style. Taiko is played loud, hard, and fast, and it involves a lot of choreographed movement in which many describe it as a form of Japanese martial arts. During this tour you will be able to watch a performance from a real Taiko artists. 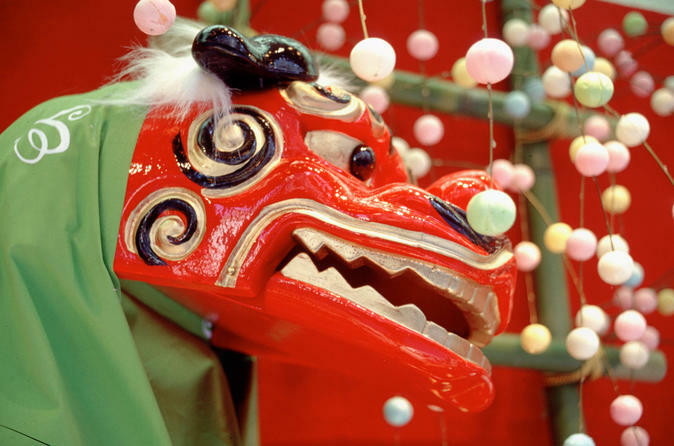 During the New Years in Japan we watch Shishimai - lion dance, it is said that the Shishimai brings good fortune so many people come and watch the lion dance. It is also said that if you get bitten by a Shishimai that it will make you more healthier and stronger, so during the New Years you will see many children getting their heads bitten. Japanese rice cakes is called Mochi in Japanese. During New Years in Japan we do Mochitsuki, where we pound the rice in a wooden container to paste patted with water by one person while another person hits it with a large wooden mallet and molding it to our desired shape. Mochi is eaten in New Years in hopes of gaining good fortune over the coming year. Kagami-Wari is a ceremony performed at celebratory events such as opening a new business or starting a new year. During the Kagami-Wari event there is sake barrel and the lid is broken open by a wooden mallet and sake is served to everyone who is present. "Kagami," refers to the lid of the sake barrel and "Wari," means to break open so Kagami-Wari literally means "Opening the lid." Because of the lid's round shape, the Kagami is a symbol of harmony, therefore it represents an opening to harmony and good fortune. On this day you will experience many Japanese New Years tradition while riding on a cruise ship. It will be an event you will never forget, start off the New Years in a special way with this trip! 8:10AM Drop off at either Hamamatsucho Station or Otemachi station.